This article explains the differences between and gives installation and maintenance advice for Sump Pumps, Sewage Ejector Pumps, Septic Grinder Pumps, Sewage Pumping Stations, & Septic Pump Alarms. We discuss sewage grinder pump types, sizes, voltages, horsepower, installation and maintenance. We also give piping size recommendations for sewage pumps and effluent pumps based on the ejector pump rate in gpm. And we include a list of manufacturers of sewage pumps, septic pumps, effluent pumps, and grinder pumps. An Environment One Corporation grinder pump schematic sketch is shown at the top of this article. What is a Sewage Ejector? Sewage ejector pumps & What's the difference between an effluent pump, sewage ejector pump, and grinder pump? Recommended pipe diameters for sewage pump installations. Advice is given for septic tank effluent or sewage pump selection, installation, maintenance, inspection, and use. Septic pumps used for pumping air in aeration systems and septic pumps used to move effluent in a drip dispersion system are discussed under the appropriate septic system type which are outlined at SEPTIC SYSTEM DESIGN ALTERNATIVES. What is a Sewage Grinder Pump or Sewage Ejector Pump? Shown above is an older model packaged sewage ejector pump provided by Environment One Corporation. A typical sump pump, effluent pump, or light-duty sewage pump has a life expectancy of about seven years but may last considerably less or considerably more depending on whether or not the installation was performed properly, whether maintenance is performed, and whether the proper pump type was chosen for the application at hand. 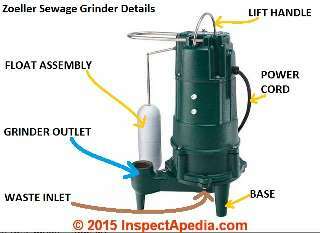 Don't confuse a sewage effluent pump or sewage grinder pump with a sewage effluent pump. The general name for sewage pumps capable of handling normal toilet-flushable waste (feces and toilet paper) is sewage grinder pumps: they are intended to grind and move black water or sewage. A sewage grinder pump is synonymous with a septic grinder pump. If the pump is intended only to move clarified wasttewater effluent, say from a septic tank to a drain field the proper term to use is sewage effluent pumps. Even if a building is nearly at the same level as its septic tank or sewer line, if the geography of the site prevents sewage from flowing fast enough on its own (two-feet per second) then a sewage grinder or sewage ejector pump is needed. A typical application of a sewage ejector pump is in a home where a basement bathroom is located lower than the height of the sewer line which leaves the home. The sewage ejector pump lifts waste from the basement bathroom up to the sewer line where it flows out to a septic tank or community sewer. A sewage or septic grinder pump, (there is more than one grinding method) reduces sewage to a finely ground slurry of waste and water which can then be pumped or forced to its destination. In the sewage grinder pump photo shown at above left, the number of wires and pipes at the tank tells us that this is a duplexed or two-pump system with two grinder pumps, two drains, and a tank alarm as well (the center wires). See SEPTIC PUMP ALARM SYSTEMS. If your building's drain system is at a level below a municipal sewer line, or if your septic drainfield or tank and fields are uphill from the building, you need a sewage grinder pump and a forced-main sewer system. If your home is connected to a community sewer line which itself uses a pumping station to move wastewater and sewage from the community sewer to a public sewage main, see our discussion of commercial-type sewage grinder and pumping systems found at at SEPTIC PUMPING STATIONS. Grinder pumps, such as Zoeller's 810/815 Turnkey Grinder Systems, 800-series Grinder Pumps, Cold-Climate grinder pumps, Simplex prepackaged grinder pump systems, and Simplex and Duplex (two pumps) grinder systems including four outdoor use. What Does a Sewage Ejector Pump Look Like? The photo at above left is a small pre-packaged wastewater ejector pump suitable for serving a sink or clothes washer; it's not a grinder pump. In the left hand photo at lower left in the picture you'll see a small white plastic water alarm that the office manager left on the floor in this area in order to detect a plumbing supply or drain leak. The sewage ejector pump photograph above shows a typical plug-in sewage ejector pump used in a home basement. Frankly, a consumer unfamiliar with these products may have trouble telling the difference by a simple exterior inspection - it's reliable to observe the product name and number and then inquire of the manufacturer about the pump's intended application and its installation requirements. But in the cases above, the overall size, location, and nearby plumbing fixtures defined the probable application of each pump even for a novice inspector and where view of the septic pump was limited. In their most common usage, packaged septic pump systems are sold in a plastic "can" which contains the grinder pump, a float control to turn the pump on and off, and watertight fittings that permit connection of the system to the building electrical system (to supply power to the pump) and to the building drain waste vent system. The pump manufacturer will provide a table of pumping capacity needed to overcome specific head or lift requirements and length or pipe run from the pumping station to its destination. An Environment One Corporation grinder pump outdoor installation is shown at left while a sewage grinder pump schematic sketch is shown at page top. Separately at SEPTIC PUMP ALARM SYSTEMS we illustrate an outdoor-mounted sewage pump alarm system provided by the same manufacturer. Not much maintenance is required for sewage grinder pumps other than clearing a blockage if you ignore our "Don't Flush" list given below. While at least some ejector pump models can tolerate being run "dry" for some time without damage, the manufacturer(s) recommend adjusting the pump float so that the liquid level in the receiving chamber never drops below the body of the pump motor. If your sewage grinder pump or sump pump is not turning on and off correctly, check the holding tank for clogging debris and check the operation of the sewage pump float control switch. Rising wastewater should lift the float that in turn operates a switch that turns on the pump. If the float is stuck by debris, obstructions or anything in the pumping chamber the sewage grinder pump cannot turn on and off as it should. [Click to enlarge any image] Above, main parts of a sewage grinder pump, adapted from Zoeller's Shark series 803-805-807. Watch out: when removing a grinder pump of sewage ejector pump from its station, do not lift the pump by its electrical wiring. Doing so risks damaging the wiring and voiding the pump warranty. Lift the pump by the steel handle or attachment intended for that purpose. Outdoor sewage grinder pump installations should be protected from surface runoff water to avoid flooding the tank or sending soil and debris into it. Safety tip: keep fences, plantings, fish ponds or other outdoor features at least two meters away from the sewage grinder pump station to reduce the chances of hitting a buried electrical wire or sending clogging roots into the system. Record the location, depth, and routing of electrical wiring to be sure that future outdoor work does not encounter or damage the system. The following examples of things to keep out of a sewage grinder pump system are excerpted from that article. A more complete list of things that should not be flushed down drains or into septic systems is organized at TOILETS, DON'T FLUSH LIST - home. Most of the sewage ejector pump installations we've inspected in residential properties use 2-inch waste piping to connect the pump outlet to the building sewer line. However the pipe diameter selection is guided by the anticipated flow rate - a figure that you can find in your ejector pump's installation and operations manual. Below we quote from Hyromatic . Technical review by industry experts has been performed and is ongoing - reviewers welcomed and are listed at "References." This article is part of our series: SEPTIC SYSTEM INSPECTION & MAINTENANCE COURSE an online book on septic systems. Sketches are from the Environment One Low Pressure Sewer Systems Grinder Pump catalog. Reader Question: what may be causing the sewage pump to run "for no reason" ? I ... hope you may be able to help me. I have a residential lift pump station in my home. It has been installed for about 25 years downstairs in my home and services the downstairs bathroom with a sink, shower and toilet and a bar sink, with little if any problems. There is very little use on this system as we have all of our appliances and upstairs bathrooms going directly to our municipal sewer system. My problem is that the lift station pump motor cuts in about every 4 hours even when there has been no waste water going into the tank from the devices that it serves. It goes through it's normal pumping action for about 15 to 20 seconds and stops and this repeats almost every 4 hours. Don't know what is causing this as we have been very careful not to put anything in it that could clog the system since we had it installed. This happened about a year ago in July, went back to normal operation over the fall, winter and spring and now it is happening again in August. Can you suggest what may be causing this intermittent problem. I purchased a new pump last year so I would have a back up but prefer not to have to install it unless absolutely necessary. Could it be that the baffle on the main sewer line going from my house may be clogging occasionally and staying open and causing water to come back into the lift station downstairs and causing the pump to cut in? You're astute to suggest the possibility of sewage backflow into your pumping station, perhaps at a slow-enough rate that it takes a rather regular number of hours before the sewage pump has to cycle on again. I suggest taking a look in the pumping chamber at the end of a pump-on cycle. Make note of the remaining wastewater level at the end of the pump cycle. If you see the wastewater rise in the pumping chamber then we need to decide where it's coming from. Look for an immediate backflow into the chamber from the pump's ejector drain line: that would indicate a bad check valve that's allowing wastewater to fall back into the pit, causing more frequent cycling than needed and shortening pump life. You may be able to see the building wastewater pipe that enters the pumping chamber from the building fixtures. If that line is not flowing then look for more slowly-rising wastewater backflowing from the exit drain line. Check the wastewater level in the pumping chamber every hour. If there is doubt about whether wastewater is entering the pumping chamber from running plumbing fixtures in the building versus from backflow in the sewage exit line, then try turning off all water into the building, then flush toilets (so we don't get confused by slow toilet tank drainage into the waste piping). For the case you are describing you may also see no drainback into the pumping chamber from the exiting wastewater line at all. Running plumbing fixtures in your building, such as a toilet that's running but perhaps slowly enough that you haven't noticed it. See TOILET RUNS CONTINUOUSLYas sometimes people miss this condition. We (and you) suggested above a backflowing sewer line or a bad checkvalve in that line (including right at the sewage pump). Also see SEWER BACKUP PREVENTION where we discuss backflow and check valves on waste piping. A second possibility is groundwater entering the pumping chamber if it has become open to soil under the building. To evaluate this possibility you'll probably have to empty the chamber completely and inspect it for damage, holes, cuts, or for entering water from around the chamber's exterior. Keep in mind that depending on how the exiting waste piping is routed, a leaky exiting waste line could itself leak and seep back into the pumping chamber. E.g. I have found a "wet basement" whose "water" entry was by no coincidence, entering the foundation wall just below the exit point of the main sewer line. Outside the building the line was broken and leaking back into the building. Continue reading at SEWAGE EJECTOR / GRINDER PUMP FAQs or select a topic from closely-related articles below, or see our complete INDEX to RELATED ARTICLES below. SEWAGE EJECTOR / GRINDER PUMPS at InspectApedia.com - online encyclopedia of building & environmental inspection, testing, diagnosis, repair, & problem prevention advice.